Gold is currently at its highest level since May, with prices surging 2.2pc this morning to $1,218.17 for an ounce of the precious metal. Gold producers are among the biggest risers on the FTSE today, with shares in Rangold Resources and Fresnillo up 6.3pc and 6.2pc respectively. Online gold investment platform BullionVault recorded its busiest-ever trading day on Monday, with investors buying and selling more than a quarter-tonne of gold, worth £7.2m, and more than 5 tonnes of silver, worth £1.7m. The World Gold Council said this morning that demand for the precious metal grew 4pc in the fourth quarter as central banks bolstered their reserves to diversify away from the dollar. 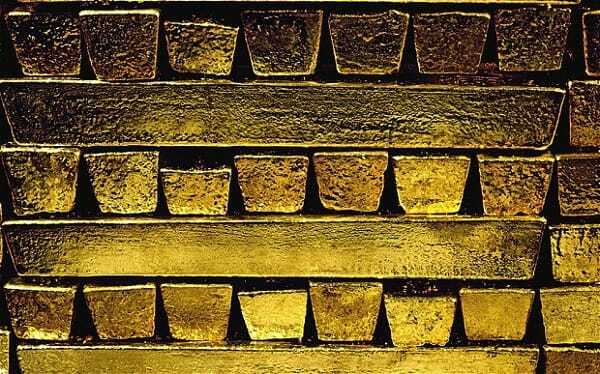 Russia’s central bank stockpiled the most gold last quarter, adding an estimated 60 tonnes to its reserves. The country bought around 200 tonnes of gold last year, 141 tonnes of which is thought to have been snapped up over the summer. Global stock markets have had a torrid time in recent months. In early trading on Thursday morning, the FTSE 100 sank to a fresh three-year low. RBS warned last month that major stock markets could fall by a fifth this year, and oil may plummet to $16 a barrel. 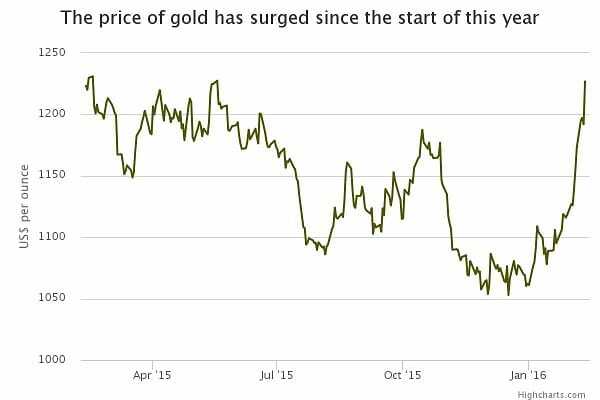 Meanwhile the price of gold, typically seen as a safe haven by investors, has risen 15pc since the beginning of the year.